You are here: Home > Vendors > H & H Fresh Fish Co., Inc.
H & H Fresh Fish Co., Inc.
H&H is family owned with 7 part-time employees in addition to Hans and Heidi. Their children Dahlia and Sebastian (Seabass) are already enjoying participating in the family business. Dahlia helps Heidi in the office and loves to sell fish at the markets. Seabass is fish obsessed and loves to help daddy fish and unload the boats of other fishermen. The fish they provide is "from our family to yours." Hans hoped to focus his thorough knowledge into a service that he could provide to his community in order to share in and spread seafood appreciation for all of its many health benefits and limitless culinary making ecologically sound choices when it comes to selecting their seafood. In 2003 he found his niche at the local farmers markets, when he & Heidi began selling his own local salmon catch. They also then got licensing to be able to purchase fish directly from local hook-and-line fishermen. Since then they have grown to include 18 markets per week and now are also enjoying taking on additional ventures with their new CSS program and even doing Oyster Bar Catering at parties, weddings, festivals, and events. H & H specializes in the finest of local & sustainable gourmet seafood. 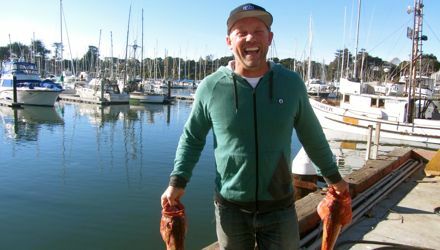 They participate at 18 select Farmers' Markets throughout the week and have Santa Cruz's first FISH CSA - Community Supported Seafood (CSS), a weekly seafood subscription program. It is because of their busy schedule, combined with direct purchasing from local fishermen, that they are able to offer product freshness that is second to none. They sell reusable cooler bags at a not-for-profit price to encourage customers to reuse their H&H cooler every week in lieu of t-shirt bags. They also welcome customers to bring their own bags. They think many people feel they can't do this with fish but they just suggest bringing two bags so we can double up in case of leaks. H&H uses compostable containers, utensils, and even pays a small fortune for the biodegradable t-shirt bags of their own accord.